SPEAKING OF WHICH: at Goodreads two of my books have 5/5 ratings. Not exactly a broad consensus (it's only two readers so far) but definitely an indication the books aren't bad, dontcha think? DK Latta has spent the better part of two decades writing about Canadian film & TV -- championing it and excoriating it both; writing about where it's come from, where it is, and where it could be heading. Along the way he has been labelled an "idiot," "pedantic," and having a "tiny brain" -- but, to be honest, not everyone has been that kind! Now for the first time comes a collection of some of his essays and blog posts -- some previously published (many re-edited and with added post-scripts) and some newly penned for this book. Tackling everything from cultural identity and what makes for a good movie to speculating on possible re-makes and listing notable Canadian bio-pics, the pieces run the gamut from whimsical to wistful to wrathful. ..has been writing fiction and non-fiction off and on for decades, his writings appearing in magazines, webzines, Huffington Post Canada, and his own websites. 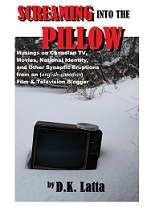 His fiction is mostly in science fiction and fantasy (and with a predilection for pulp genres and superheroes) and his non-fiction has mostly (though not exclusively) been focused on Canadian film & television (where, as a Canadian, he is intrigued by issues surrounding cultural identity and representation) with a side helping of opining on comic books and science fiction. Strange Horizons, Daily Science Fiction, New Myths, Escape Pod, Perihelion, Crimson Streets, and others. And in the anthologies Masked Mosaic: Canadian Super Stories, Tesseracts Nineteen: Superhero Universe, Lords of Swords, and others. Some non-fiction, non-Canadian writings include book, graphic novel, and audio drama reviews and essays still on-line at Strange Horizons, Black Gate, Dark Worlds Quarterly and elsewhere. And recently one of his stories was solicited for translation into Finnish! Links to some of his stories and writings (available on-line and for free reading) can be found here. "What if...?" there was a Canadian superhero universe spanning from the 1940s to today? What if there had been a Marvel/DC-style publisher unfurling a pantheon of heroes reflecting the turmoil of their respective decades? That's the ambitious question The Masques Chronicles asks -- and audaciously tries to answer! It's a two-volume collection of superhero mystery and adventure prose stories stretching from sea to sea to sea and spanning eight decades: Vol. I (The Golden Age to the Silver Age) and Vol. II (The Bronze Age to the Modern Age). I've also been writing occasional "Behind-the-Scenes" posts delving into the genesis of some of the stories (hoping to intrigue readers)...as well as other comic book related essays here. Come back to the dark days of WW II and thrill to the exploits of a band of costumed adventurers -- The Fellowship of the Midnight Sun -- who battle Nazi schemes, ruthless villains, and even a threat to time itself while guarding the Canadian homefront. The "Golden Age" of superheroes and pulp magazine adventure comes alive (with a Canadian spin) in these three thrill-packed novellas collected together in one volume.